Oil Cleansing Method - Have you tried it? Oil cleansing method is a method that uses a blend of oils to cleanse the face. The oils used in this method are castor oil and extra virgin olive oil or sunflower oil which are used in different ratios depending on the skin type. 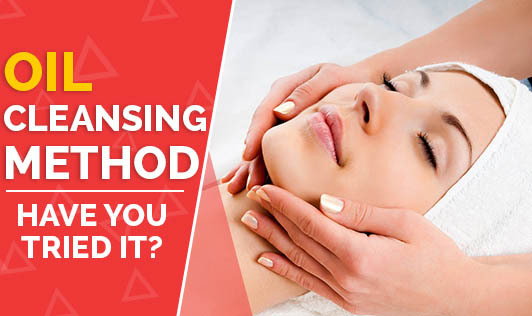 The theory behind this method is that the impurities along with the natural oils that have hardened in your pores will be dissolved by the massage oils leaving your face clean and supple. How is oil cleansing done? 1. Mix castor oil and olive oil in the right ratio based on your skin type (Refer Notes, to know the combination of oils based on your skin type). 2. Pour the oil blend on your palm and rub it well to make it warm. 3. Apply the warm oil blend on your face and gently massage till your face absorbs the oil almost completely. 4. Soak the washcloth in warm water and place it on your face till it cools down to open up the pores. 5. Gently wipe your face with the washcloth to remove the oil. Rinse your face well. 6. Repeat steps 4 and 5 two to three times till the oil is removed. 7. If your face feels dry, take one drop of the blend and apply it on the damp face to moisturize it. 1. You can oil cleanse your skin 1-2 times a week. 2. If your skin feels dry, reduce the amount of castor oil used as it tends to dry your skin. 3. This method is considered to be excellent even if you have acne, blemishes etc and is found to clear your skin. 4. If you have acne, your face may worsen in the first 2 weeks of cleansing, but this is only because your body is getting rid of all the impurities. Your skin will start to clear out after 2 weeks. For dry skin: 10% castor oil and 90% extra virgin olive oil/sunflower oil. For oily skin: 30% castor oil and 70% extra virgin olive oil/sunflower oil. For normal skin: 20% castor oil and 80% extra virgin olive oil/sunflower oil.